Flaming Moe's is located in Springfield in Universal Studios Florida. Flaming Moe's is a walk-up drink counter in the Springfield Area of Universal Studios Florida. This Simpson's themed drink counter serves Flaming Moe's, the signature drink of Springfield as well as a few other themed drinks like the Mt. Swartzwelder Apple Drink, Buzz Cola, and Duff Beer. If you want alcohol, you're going to need to go with the beer. 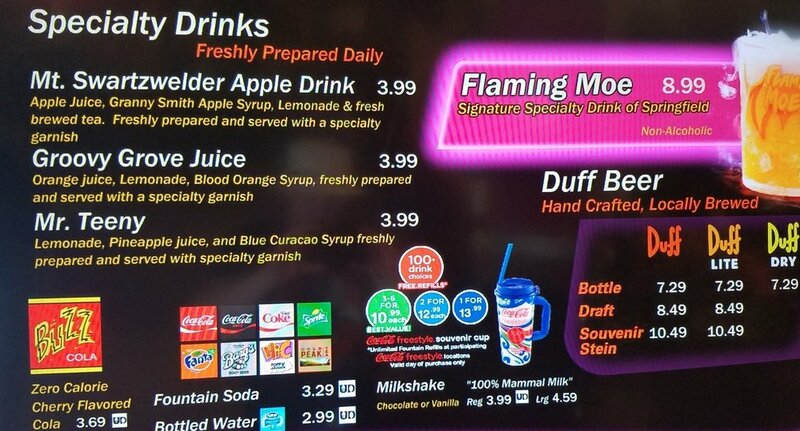 All of the other drinks served at Flaming Moe's, including the Flaming Moe, are non-alcoholic. Seating is available inside and outside of the Krusty Burger building. You can also sit in the adjoining Moe's Tavern. 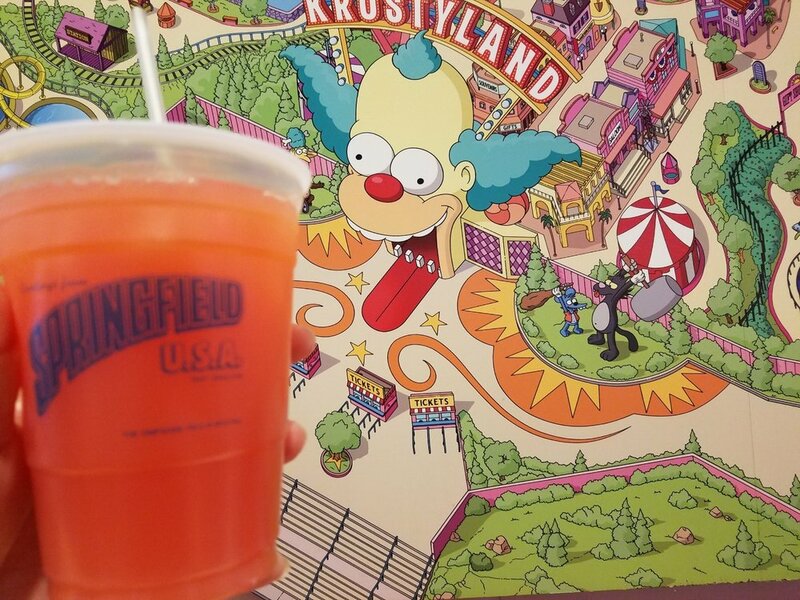 You'll find Flaming Moe's in a food court alongside other Simpsons themed dining options like Krusty Burger, The Frying Dutchman, Cletus' Chicken Shack, Lisa's Teahouse of Horror, and Luigi's Pizza. To get there, you'll need to go into the Krusty Burger building. Flaming Moe's opens daily at 11:00 a.m. and usually stays open until park close. *Menu prices last updated January 2018. 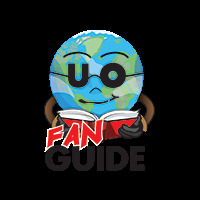 You can use the Universal Dining Plan on menu items marked with UD. Flaming Moe: Simpsons fans will immediately note that this drink isn't exactly canon. On The Simpsons TV show, the Flaming Moe is an alcoholic purple beverage, but in Universal, it is a non-alcoholic orange soda. If you like orange soda (like Fanta Orange or Sunkist Orange Soda), you'll like Universal version of this drink. When it is served to you, you'll see "smoke" wafting from the top of the Flaming Moe. This is courtesy of the dry ice located in a bottom chamber of the plastic cup it's served in. You get to keep the cup as a souvenir. We like the taste, "smoke," and souvenir cup, but feel like this drink is wildly overpriced at $8.99 considering the small size of the drink. Mt. Swartzwelder Apple Drink: This specialty drink is a unique shade of green. It has a tart taste and is probably the least sweet of all of the specialty drinks served at Flaming Moe's. We think this drink is yummy, but if you don' like the taste of green apple, you'll want to get something else. Groovy Grove Juice: This specialty drink is a strange pink-orange color, but it tastes delicious. It is sweet and refreshing without being overly sweet (like the Mr. Teeny drink). 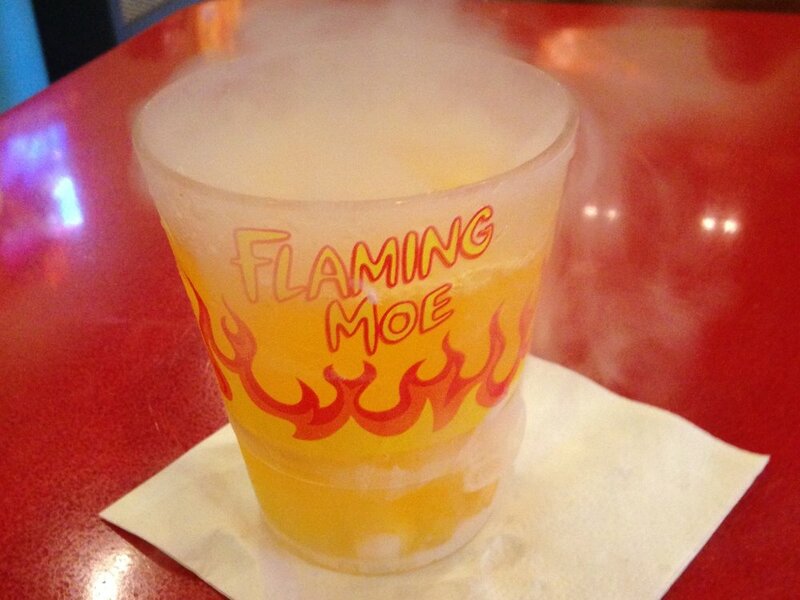 It is our favorite specialty drink at Flaming Moe's and the one we would recommend above all others. Mr. Teeny: This blue concoction is the sweetest of all of the specialty drinks served at Flaming Moe's. We blame the color and the cloyingly sweet taste on the Blue Curacao Syrup. If you want to try all of the specialty drinks at Flaming Moe's, we recommend putting this one at the bottom of the priority list. Buzz Cola: This is a zero-calorie cherry flavored cola. It is served everywhere in Springfield and makes a nice change from the regular Coca-Cola fountain drinks served everywhere else. We have lost count of how many times we have gotten this drink and consider it the perfect accompaniment to a Krusty Burger. The Groovy Grove Juice drink. The Flaming Moe drink is inspired by the Flaming Moe drink from episode 45 of The Simpsons TV show. The drink was originally invented by Homer Simpson, but the recipe was stolen by Moe, who served it to patrons at his tavern. Krusty Brand non-narcotic cough syrup was the drink's secret ingredient. The Mt. Swartzwelder Apple Drink was inspired by the Mt. Swartzwelder Historic Cider Mill seen on episode 157 ("Burns, Baby Burns") of The Simpsons TV show. The mill gets its name from John Swartzwelder, a writer on The Simpsons. The Mr. Teeny drink is named after Mr. Teeny, Krusty's trained monkey. Groovy Grove Juice is named after Groovy Grove Natural Farm, a hippie commune where Homer's mother Mona Simpson lived for a time.